The center was founded in 1986. Its first name was Center of Mental and Physical Rehabilitation for Orphans - Malnourished and Social Disabled Children. It was renamed of Center of Rearing Orphans and Disabled Children of Quang Nam since January, 2009. The Center has been carrying out the duty of receiving, managing and bringing up as well as rehabilitating functions of mentality and physicality for disadvantage and invalid orphans and abandoned children, etc. The age of child being cared for is from at the age of 0 to the age of 18. The children who reach the age of 18 are allowed to integrate into community. The children capable of studying more at universities or colleges will be supported by the center during the time they are studying to have stable jobs in the future. The children who are old enough, but are not able to study further, will be sent to learn jobs at vocational schools or center and will be found suitable jobs after that so that they can integrate into community and can live on by themselves. Annually, on the average, there are about from 1 to 10 children integrating into community. Among them, there are about from 1 to 3 graduated from universities or colleges. There are some to be construction engineers, lawyers, teachers, accountants and some are workers in garment industry or working in hotels..
+ The school fees are exempted by the government. Expense source is always announced, reported publicly. Every day, every month and every three months the figures are noted and recorded in details. There is always a meeting at the end of the month to report publicly before the staff as well as the assembly of older children on the diet and to answer the questions promptly based on the public and democratic spirit. The staff who directly care for the children include 25 employees. The salary is entirely paid by the government. Most of the staff have been working in the Center for more than 10 years, among them Mrs. Pham Thi Cong has been working in the Center since it was founded to present (more than 25 years so far) and she was appointed to be the director of the Center since mid August, 2009. The daily routine of the staff is to manage, care and rear the children within 24 hours a day and to rehabilitate the disable children every day alternately. They are also on duties in rotation all days and all nights at the hospital whenever the children are sick. In addition, the staff have to control and educate the children on the aspects of morality and learning as well as to bring up them, considering them their own children at home, helping them overcome the inferiority complex so that they have joy, obedience and good studying. The aims of the Center are to rehabilitate mentally and physically disabled children to help them care for themselves without needing assistance from the staff, to help them have better studying environment to get more knowledge in order that when they integrate into community, they have stable work and have brighter future. So we believe and hope that the philanthropists will come to visit and help the children together with us in order to bring joy and happiness to the unfortunate children. 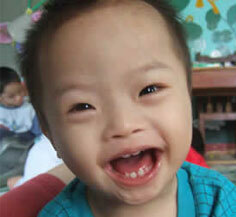 Each joy, each smile of the orphan children, the disabled children is certainly the happiness of us. Our center desires to receive more interest from philanthropists to help children develop completely and when they leave the Center, they have stable lives. 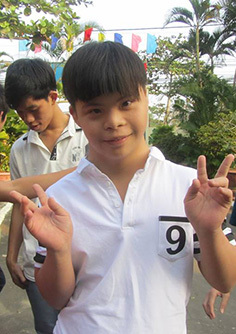 The Quang Nam Center for bringing up orphaned and handicapped children would like to thank all of you who assist us and we promise to try our best to bring better lives to our children.